I am so happy because it's been a long time coming and I am pleased to announce All The Weight of Our Dreams is available! 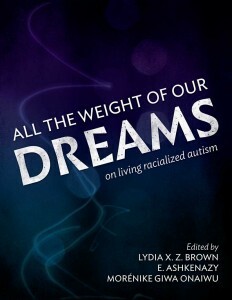 I had mentioned last year I was contributing to two autistic anthologies and All The Weight of Our Dreams is the first one out. The second one should be available in November 2017. Cross your fingers! It's also available from Amazon and a pay-what-you-can version is promised soon. Stay tuned as I hope to be able to do a few public readings of my piece.